SureSeals are sold as a kit which includes a section of articulating hose (in most instances) and four hose clamps. Use our SureSeal Locator or the Imperial or Metric Size charts to determine your part number. A hose running from a point on the engine's raw water cooling system to this single injection fitting that will deliver cooling/lubricating water to the SureSeal. This water supply should produce a minimum of 1 gallon per minute at idle speed and approximately 2 psi. It should increase as you throttle up. Tides Marine offers a water pick-up kit to complete your installation. 1. Hose Tee: In-line between the heat exchanger and riser (as close to the heat exchanger as possible). 2. 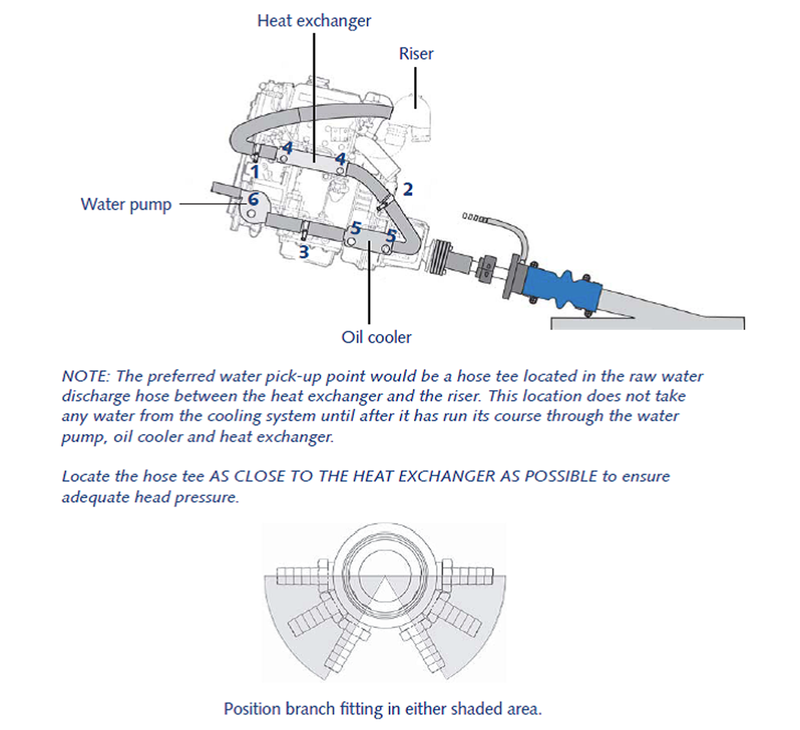 Hose Tee: In-line between the oil cooler and the heat exchanger. 3. Hose Tee: In-line between the water pump and the oil cooler. 4. Drain Plug: Hose barb in the heat exchanger. 5. Drain Plug: Hose barb in oil cooler (if oil cooler is on pressure side of water pump). The bore should be at least .200”. 6. Drain Plug: Hose barb in the back of the water pump. Be sure the drain is on the pressure side of the pump. When the engine(s) is/are installed below the waterline (or water-lift mufflers are used), a vented loop may be required to prevent back-flooding of water through the exhaust system and into the engine. Follow ABYC guidelines regarding materials and installation practices. The vented loop or siphon break should be checked for proper function annually at a minimum. The water pick-up fitting should be installed on the “pressure” side of the vented loop “T”. This vented loop should be as far above the waterline as is practical (a minimum of 12″ is required). In twin-engine installations with water-lift mufflers, a check valve in each of the water pick-up lines is required if a crossover line is used between two SureSeals. The check valves should be checked for proper function annually at a minimum. A. Tides Marine SureSeals require no winterization. Winterization fluids will not harm the SureSeals. B. SureSeal assemblies should be inspected at least annually. i. Inspect the blue articulating hose for damage. ii. Inspect the hose clamps for corrosion. iii. Remove the water injection hoses from each SureSeal and make sure the fittings and hoses are free of debris. iv. It is very important to regularly check the pick-up point and water flow in the engine’s raw water cooling system. The water flow should be checked anytime the vessel has run hot or been aground. If this fitting is a hose barb, Tides recommends that you remove the fitting from the pick-up point. Make sure it is free of debris, corrosion, etc. It is also a good idea to inspect the pick-up point for any debris that may have collected since the last inspection. If your water pick-up system uses hose tees, you should not have to remove the tee. Simply check the branch fitting on the tee to make sure it is free of debris. v. If your water pick-up system has any shut-off valves, check valves, siphon breaks or sight-gauges, be sure to inspect these as well. vi. Make sure all hoses and clamps are re-assembled securely once you have completed any regularly scheduled inspections. These products are available in custom sizes. Contact Tides Marine for more information.